ESCAMBIA COUNTY, Florida - A Florida attorney who advertises that he will not represent DUI defendants was charged with a DUI, according to Escambia County Jail records. 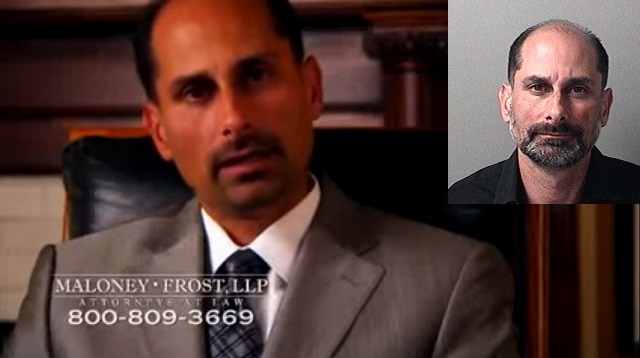 "When a person is injured in a drunk driving accident, the personal injury lawyers at Maloney-Frost, LLP take it personally. We aggressively pursue cases against irresponsible drunk drivers and the bars, restaurants, and social hosts who serve alcohol to already intoxicated patrons or minors. Drunk drivers choose to be irresponsible. And every time an impaired driver chooses to get behind the wheel, he or she puts everyone else on the road at risk of injury or death. We fight to get maximum compensation for injury victims who have suffered harm because of the senseless and selfish acts of irresponsible drunk drivers." But just after 3:30 a.m. on Mother's Day, Maloney was pulled over by an Escambia County Sheriff's deputy for allegedly speeding in a Lamborghini in Pensacola Beach, Florida, WEARTV reports. According to the arrest deputy, there was enough probable cause during the traffic stop to charge the 49-year-old Florida man with driving under the influence. Escambia County Jail records show that the north Florida lawyer was released later the same morning on a $500 bond.